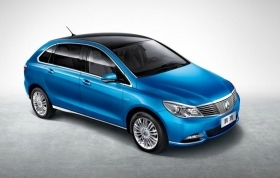 Denza is the first model developed by Daimler and partner BYD in China. Daimler and Chinese partner BYD Auto unveiled a production-ready version of their Denza electric car at the Beijing auto show ahead of a sales launch in September. The EV will sell for 369,000 yuan (42,700 euros) and above before subsidies. It is eligible for government incentives that vary from 111,000 yuan to 117,000 yuan in six cities: Shenzhen, Shanghai, Beijing, Guangzhou, Hangzhou and Tianjin. "Denza is the first complete vehicle that Daimler has developed together with BYD outside of Germany and it is undoubtedly one key pillar of Daimler's electric vehicle strategy in China," Thomas Weber, Daimler's r&d chief, said in a statement. The Denza is 4642mm long, 1850mm wide and 1642mm tall, with a wheelbase of 2880mm. It has a range of 253km on one charge and a maximum speed of 150kph. The battery requires 15 hours to get a full recharge from public charging stations and 32 hours from home charging devices. Shenzhen BYD Daimler New Technology Co., a 50-50 electric vehicle joint venture between BYD and Daimler was established in 2011 in the south China city of Shenzhen, where BYD is headquartered. Under an agreement signed by the two partners, Daimler is contributing expertise in EV architecture and safety, while BYD is sharing batteries and electric motors. BYD, a leading Chinese gasoline and electric vehicle maker, is listed in Hong Kong and Shanghai. It is partly owned by U.S. billionaire Warren Buffett.